Please note, these are all of the weapons found thus far in the game. If we find any more hidden weapons, we’ll be sure to update this page. 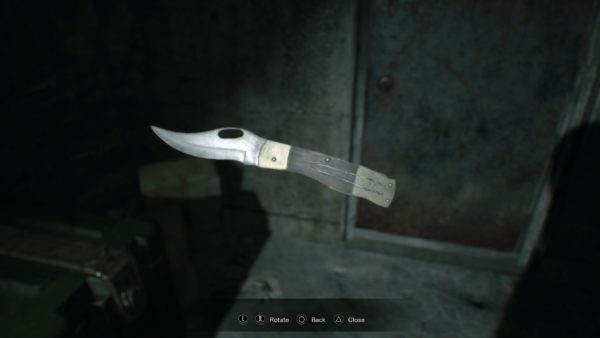 This folding knife is the first weapon you get during the main portion of Resident Evil 7 (when you find yourself inside of the main Baker house). It’s actually given to you by a police officer who can be found outside of the window near the stairs to the basement. In order to get the cop to appear, you must first access the laundry room by getting the keys to the floor hatch. You can’t progress without the knife so it’s not missable. 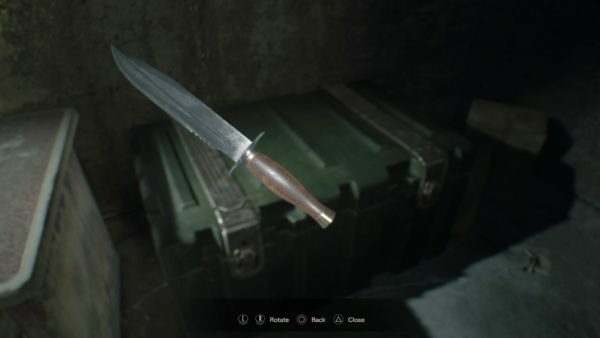 The survival knife is actually Mia’s weapon. You don’t gain access to this longer blade until you reach the boat section near the end of the game. Once you complete her section, you will gain access to any weapons of hers that you collected during your time with her. Since the Survival Knife isn’t missable, you’ll be sure to add this one to your collection. It can be found in any Item Box after regaining control of Ethan. The Handaxe is actually the very first weapon you get your hands on in the entire game. You find it on the floor after Resident Evil 7 throws its first terrifying enemy at you. Unfortunately, you don’t keep it for the rest of the game. It’s only available during the prologue, and you only fight one enemy with it. It’s not missable, but it’s not one of the keepable weapons either. 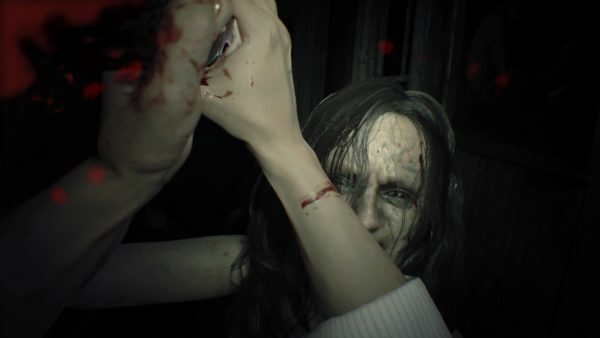 The crowbar is actually only available in Resident Evil 7 for a single encounter, which is a shame because the other melee weapons lack the same amount of heft and blunt force. You’ll obtain it immediately after regaining control of Ethan while on the tanker. Once you use it, it goes goodbye forever. 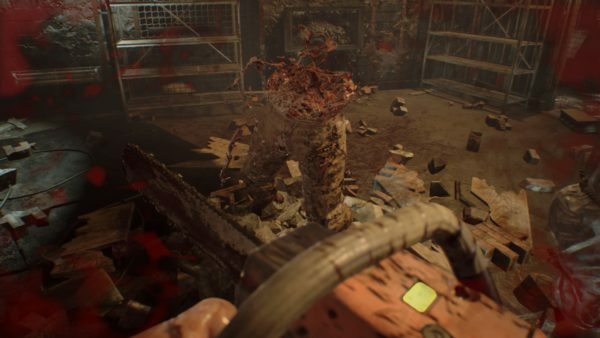 The chainsaw is a true force of destruction. 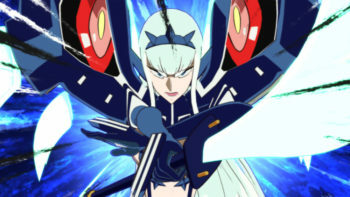 It’s able to counter powerful melee attacks and tear right on through evil adversaries. You get to use one during the story when reaching the second major boss encounter in the basement of the Baker house. You don’t use it again in the story unless you unlock it by beating the game, which makes it available for the main game. The M19 is sort of a secret weapon that you can unlock while playing, unlike other secret weapons which are obtained by beating the game in different ways. You’ll find a Broken Handgun pretty early on in the game. If you’ve ever played a Resident Evil game before, then you know to keep this. You don’t have to carry it around, but make sure to drop it in an item box when you get the chance. Later on, you’ll come across a treasure photo that shows a mannequin head with a blue baseball cap on top of a steel shelf. That spot is in the upper right-hand corner of the second floor of the Testing Area (Lucas’ part of the map). 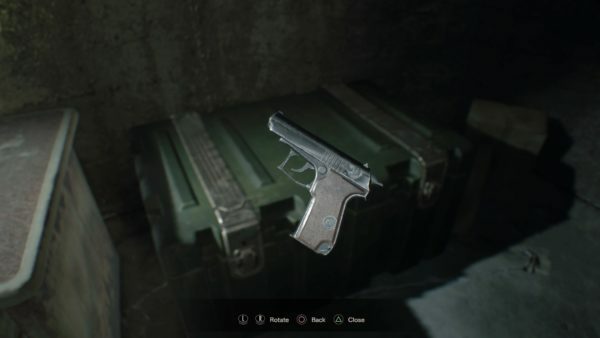 You’ll find a repair kit which you can use on that Broken Handgun to get the M19. 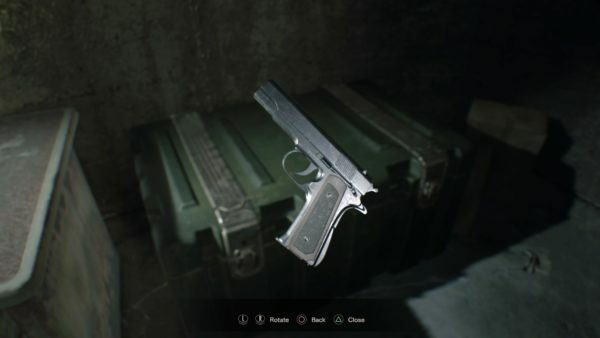 If you were paying attention during the prologue, you’ll recognize this as the gun you found in the attic of the house. Jack or another Baker most likely broke it after catching you, since they have no use for firearms themselves. 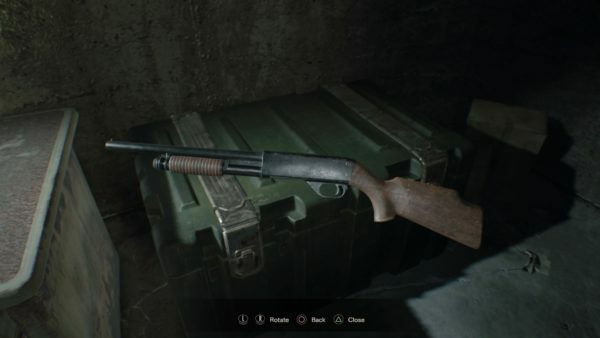 You’ll actually see the shotgun very early on in Resident Evil 7, after making your way to the main hall of the Baker residence. It’s being held by a statue, but when you lift it the doors lock, requiring you to put the gun back into place. In order to be able to take the gun out of this small enclosure, you’ll have to first gain access to the grandmother’s room which is just off to the side of the game room. You’ll need the Scorpion Key to access this room. Inside, you’ll find a Broken Shotgun which you can use to swap for the working one on the statue. Takes up two item slots. 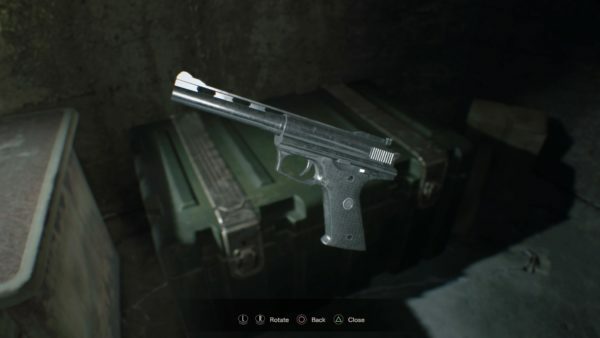 This is another one of Mia’s weapons that you can unlock for Ethan (and you should, as it’s one of the more useful guns at the end of the game). When playing on the ship as Mia (present day), you’ll be able to climb a ladder all the way to the fourth floor which is where the Captain’s Room is. There is a locker in the room that requires the Captain’s Key. You’ll find the key in the bottom part of the Bunk Room on the second floor (you’ll need corrosive to open it). Grab the key and head back up using the ladder in the elevator shaft to go back to the Captain’s Room and get the powerful, rapid-firing weapon. 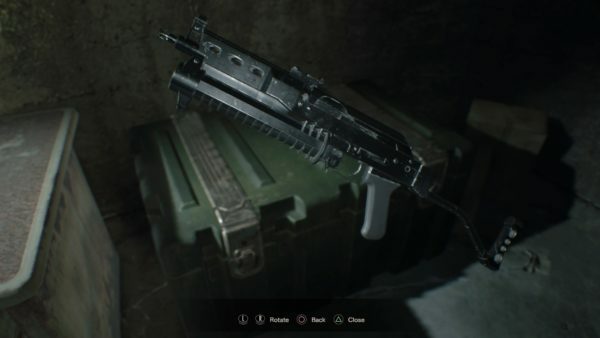 Once you complete Mia’s portion of the of the game, you’ll be able to grab the Machine Gun from an item box after getting control of Ethan again. It is missable, so don’t forget it. Takes up two item slots. 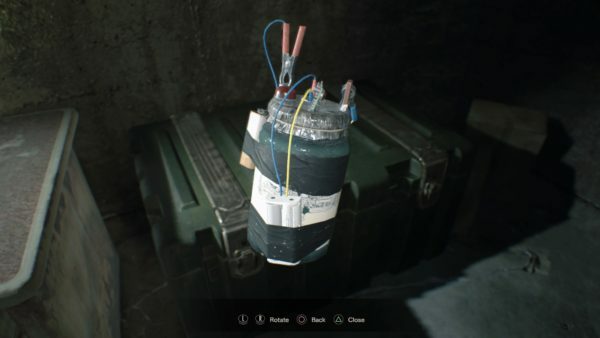 The Remote Bomb is one of the most useful weapons in Resident Evil 7 when dealing with groups or if you happen to get tackled by a Molder. You can’t miss these as you’ll obtain them once you reach the boat, and you’ll find more during all the later areas of the game. Mia will transfer some over to Ethan, but even if you ran out as her, you’ll find more before the game is over. How many you find depends on the difficulty you chose to play on. 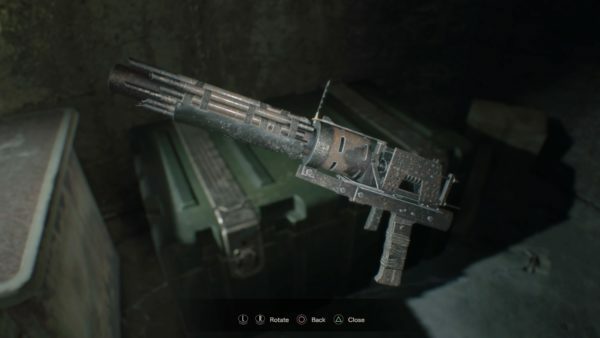 The grenade launcher is another missable weapon in Resident Evil 7, as it’s located behind a locked door in an area that you really have no reason to revisit unless you were just really curious about what lay beyond that locked door. There is a door with a Scorpion lock in the southeast corner of the Baker house, right off of the Drawing Room (which you reach by solving the first light puzzle in the game). If you return once you get the Crow Key, you can access this room (which is marked Supplies) to get some ammo, healing items, and a Grenade launcher. Ammunition for this weapon is scarce (even on Easy), so save it for bosses, or tough groups of enemies. Takes up two item slots. 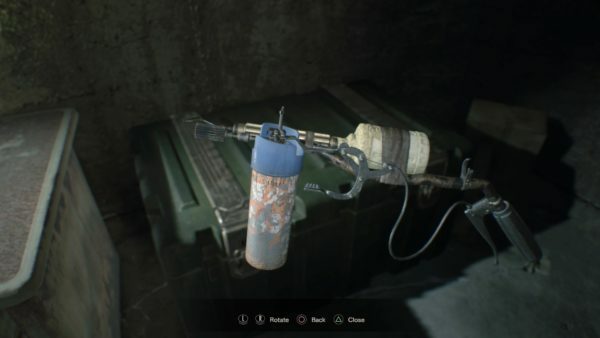 The Burner is Resident Evil 7’s flamethrower. It’s good for dealing damage overtime, and can stun certain enemies after sustained fire. It’s most useful for the Old House section of the game, as it’s full of insects and the boss is especially weak to flames. It’s found in two parts within the Old House area. When you first get to the house, search the porch to the side (that leads to the water house) for the first part. Then continue on to where you solve the light puzzle. Right outside the door near that puzzle is the other half. Takes up two item slots. 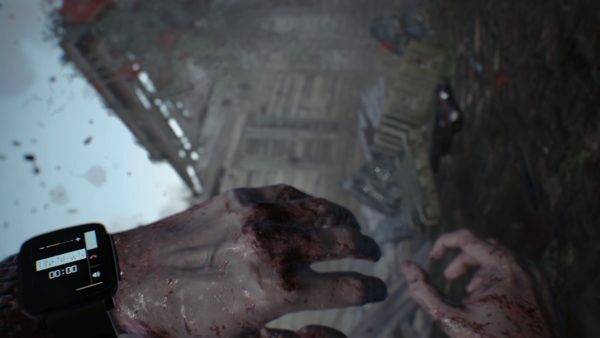 The 44 MAG is revealed to players once they finally exit the Baker house. It’s one of the most powerful weapons in the game, capable of blowing a Molder’s head clean off, and stopping bosses dead in their tracks for a second. You need 9 Antique Coins to get this bad boy. You can find them scattered around the game. Just bring them back to your trailer to place them into the locked birdcage and claim your prize. Do note that the ammo for this weapon is quite rare, even on Easy, and that you can’t craft any. Takes up two item slots. 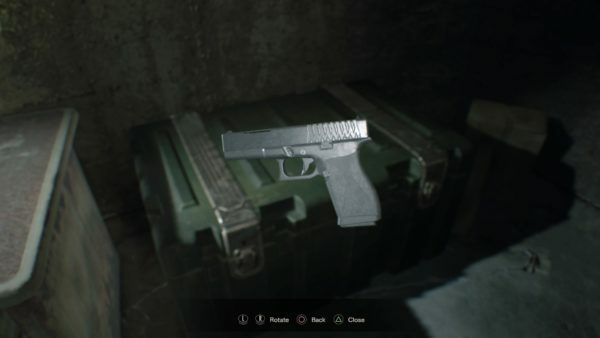 The G17 is the first firearm you obtain in the main portion of the game (after you wake up to dinner at the Baker’s). 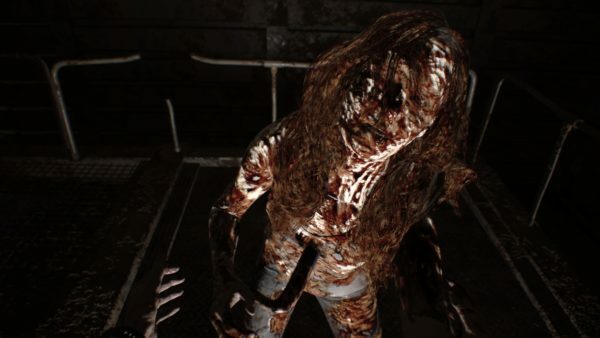 After obtaining the knife from the police officer, head downstairs to open the garage and after watching a gruesome murder, you can pick up the gun from the floor as the first real boss fight in Resident Evil 7 kicks off. This is the last of Mia’s weapons that you can transfer over to Ethan. Once you complete her section, the gun goes to the Item Box. This is a powerful weapon that actually breaks down the infection creating the Molded. No, that doesn’t mean it cleanses your opponents, it just kills them a lot faster. Even better is that it doesn’t use special ammunition, it runs right off of handgun ammo (huzzah!). To unlock this weapon, though, you’ll have to beat the game (Easy counts). 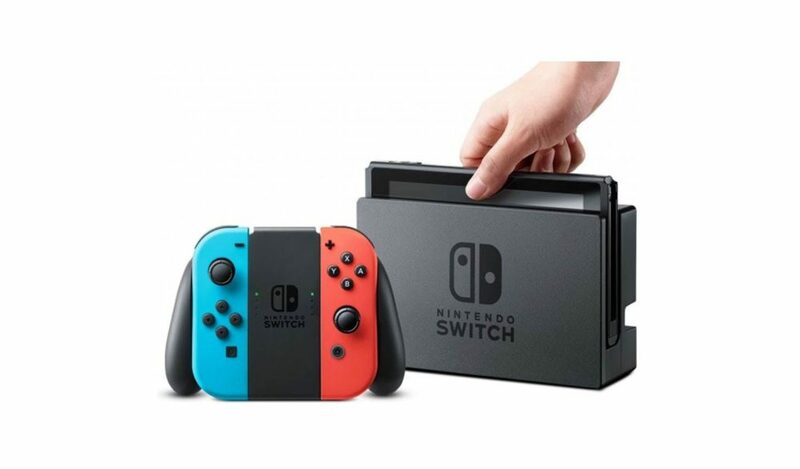 Once you start a new game, you’ll be able to grab it out of any Item Box.